Republican presidential candidate Newt Gingrich decided to exercise his historical knowledge tackling the decriminalization of marijuana and the opinions of our founding fathers, in particular George Washington and Thomas Jefferson. If Newt Gingrich needed a reminder that he wasn't in Iowa anymore, it came rather quickly during his first appearance here Wednesday, when he was pressed on three separate occasions about the overreaches of federal drug policy. During a town hall-style appearance in Concord, the former House Speaker said he had no interest in exploring drug decriminalization, arguing that such efforts haven't worked in Europe. Contra Gingrich, however, Portugal has had some success with decriminalization initiatives. Pushed a bit later on the incarceration rate related to petty drug crimes, Gingrich responded, "I think the best thing is to get young people not to do drugs and then you won't be dealing with criminals that you just described." A third resident of the "live free or die" state argued that the founding fathers had been far more lenient about marijuana than the current political class. "I think Jefferson or George Washington would have rather strongly discouraged you from growing marijuana and their techniques with dealing with it would have been rather more violent than our current government," Gingrich replied. This is where Gingrich the Historian demonstrates his lack of knowledge - both Washington and Jefferson both grew marijuana, or hemp, on their Virginia farms back in the day. Botanically, marijuana equals hemp. As we've established in the past, these are basically two names for the same plant. Useful for rope, paper, and clothing, hemp was long promoted in Virginia as an alternative cash crop to tobacco. Tobacco depleted the soil, and gluts sometimes drove prices down. Shifting economics led to a small "hemp boom" by 1765. In two Virginia counties, folks were allowed to pay their taxes in hemp. Both Washington and Jefferson tried growing hemp on their Virginia farms, with mixed success. Washington used some of what he grew to make hemp clothing worn by his slaves. However, U.S. hemp exported to Britain often was of such poor quality that it couldn't be sold, and Washington was never able to turn a profit on the crop despite sustained effort. Jefferson also seems to have grown hemp strictly for local consumption, from which we deduce he couldn't make money at it either. In short, not only were Washington and Jefferson marijuana farmers, they were unsuccessful marijuana farmers. 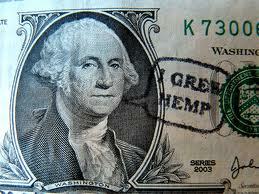 Notwithstanding their failure to make a fortune from hemp, Jefferson and Washington kept at it. Washington continued to tout the crop after he became president. Jefferson invented a better "hemp brake" to separate the fibers from the stalks, something he thought was so important agriculturally that he refused to patent it. This tells us two things. First, Jefferson ran an advanced marijuana processing facility. Second, he was a socialist. Both Jefferson and Washington traded seeds and plants with other farmers on a regular basis. Jefferson wrote of receiving hemp seedlings from someone in Missouri, and it would have been only neighborly to send some Virginia seedlings back. Chances are Washington did the same. Couple this with the fact that the two men at least tried to sell their hemp crops and we're obliged to conclude: Washington and Jefferson weren't merely marijuana farmers, they were marijuana dealers.